This is a site dedicated to bring you the most up to date and researched products to keep you Youthful & Ageless. Initiated by Atlantic Publicity it’s featured products can be regularly seen on Cable News Networks and various airlines including the second biggest in the world, American Airlines. There are frequent editorial feature articles in various publications about any which product / service listed on this website. Unlike any other company, we thrive to reach the highest number of your target audience ( half a billion) with the shortest period of time and the least amount of investment with an unusually high return. With our proprietary program we are able to reach half a billion well to do demographics. Those who can buy what they see, when they see it. Our production team will produce a Video Interview Presentation or what we call a VIP for short. We start by recording a one-on-one audio interview by phone with your spokesperson. Interview questions are prepared in advance. We use your interview as the soundtrack and illustrate your VIP with your visual assets (ie. photos, images, graphics, logo, and any video you have). This keeps the eye moving and text is used to highlight key points. We use motion graphics to unite the video stylistically. We collaborate on all content and you have final approval. The end result is a visually engaging video employing your logo and branding, and visual assets timed to your interview. If you don’t have any visual assets, we will create your video using our library of royalty-free images and graphics. Your video will air worldwide to 8.4 million travelers on 58,000 American Airlines flights for two consecutive months for first and business class travelers. Viewers include hard-to-reach C-level executives, decision makers, investors, entrepreneurs and early adopters. As an added benefit, your video can be re-purposed on your website, social media and in other promotions for years to come. Your in-flight video will be 2 minutes long. In addition to your 2 minute long In-Flight video, we will also produce a 30-second editorial style television commercial to air on Cable News Networks. Over the years we have developed a loyal audience due to our personal collaboration with our customers. When it comes to your in-flight-video we can draft suggested interview questions for your review and approval, or of course you can draft your own questions. All creative, host talent, voice over artist and production is included, and distribution and re-usage rights are yours to keep and put it on your website or anywhere you wish! Your interview will also be rebroadcast on our sites… the people interviewed on these programs are recognized names, and successful companies that are examples in many ways. There are about 15-20 people interviewed in a two-month segment, and the entire segment repeats over and over for the duration of the flight in a loop. International Flights make up about 20% and National Flights about 80% of all American Airlines. The program is also going to be in the chosen airline’s magazine during both months of your choice. The magazine is in every seat’s back and has a circulation of 320,000 every two weeks. The entire recording process is very turnkey. We only need 10 – 20 minutes of your time to perfect the interview. 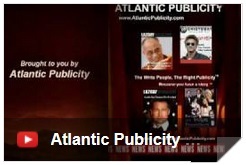 What Does Atlantic Publicity Do?